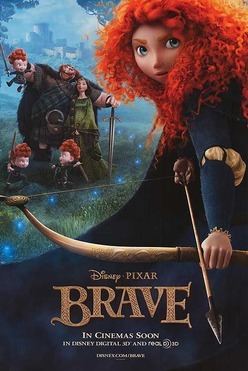 "Brave" (2012) from Pixar directors/writers Mark Andrews, Brenda Chapman and Steve Purcell (Irene Mecchi also helped with the screenplay) is a computer-animated tale set in mythical Scottish Highlands. While "Brave" was the usual financial success for Pixar/Disney, it has a decidedly different tone to it than their usual humorous offerings. Naturally, though, it looks just as terrific as all their other animated films. Young Merida (Peigi Barker and later Kelly Macdonald) is the daughter of King Fergus (Billy Connolly) of the Clan DunBroch. He gifts her a bow for her birthday, and she spends time practicing with it. Later, a giant demon bear named Mor'du attacks the clan, and Fergus loses his left leg defending his family. 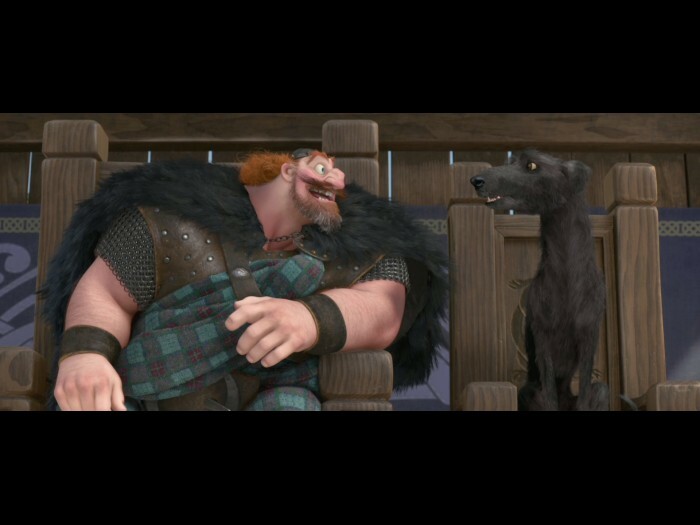 Merida escapes along with her mother (Emma Thompson), but King Fergus loses his left leg while protecting his family. 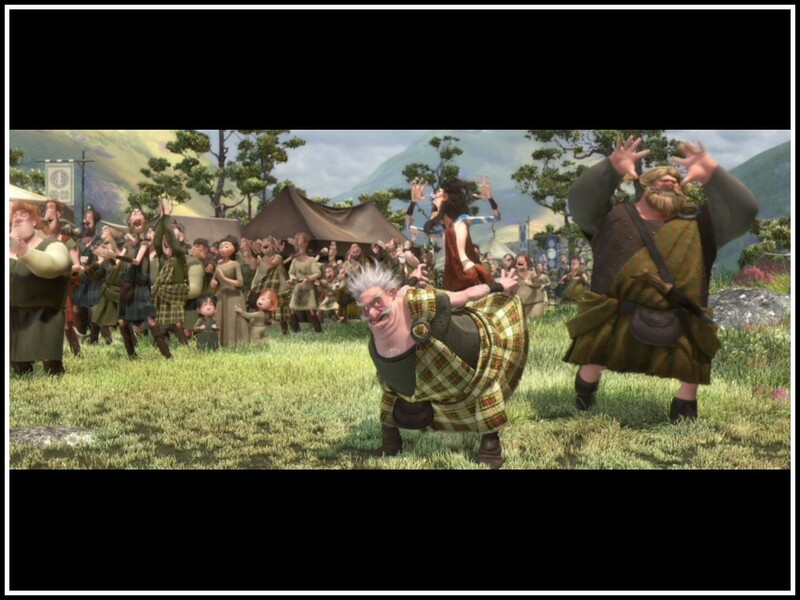 Merida grows into a rebellious teen, and her parents have triplets: Hamish, Hubert and Harris. A marriage is arranged for her, but Merida is unwilling to go along. A tournament is arranged, and the first-born sons of numerous clans arrive. The winner will have Merida's hand in marriage. 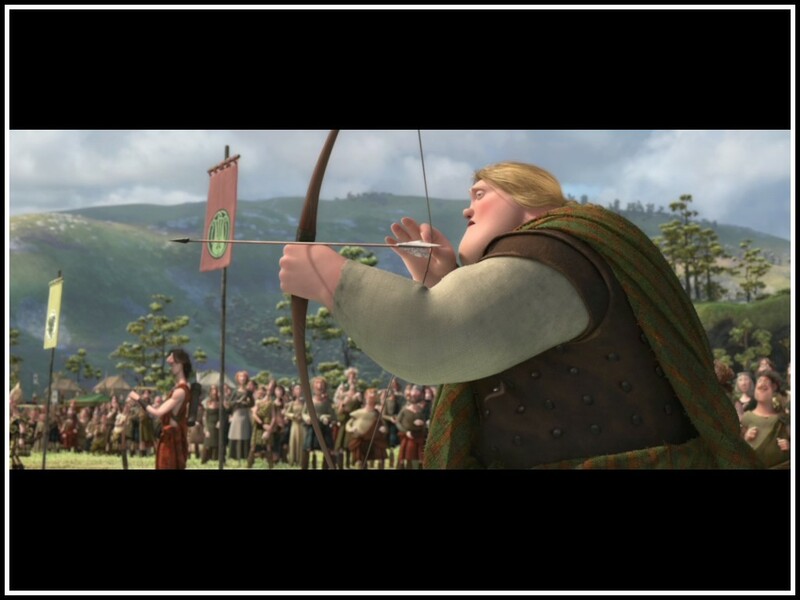 Merida, though, wants to compete as well, which annoys her mother. Running off in frustration, Merida meets a witch who gives her a cake for her mother, saying it will "change" her. Merida returns to the castle and gives her mother the cake, which transforms her into a large black bear. 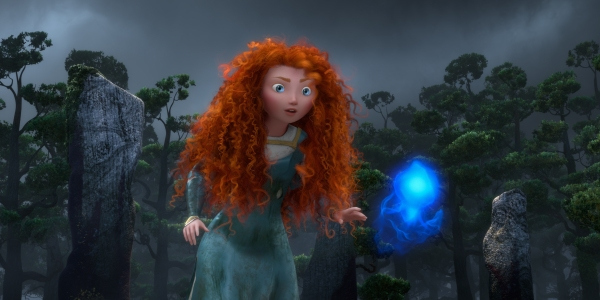 Returning to find the witch gone, Merida learns that her mother will remain a bear unless the spell is lifted quickly. Armed only with clues left by the witch, Merida must figure out a way to reverse the spell. 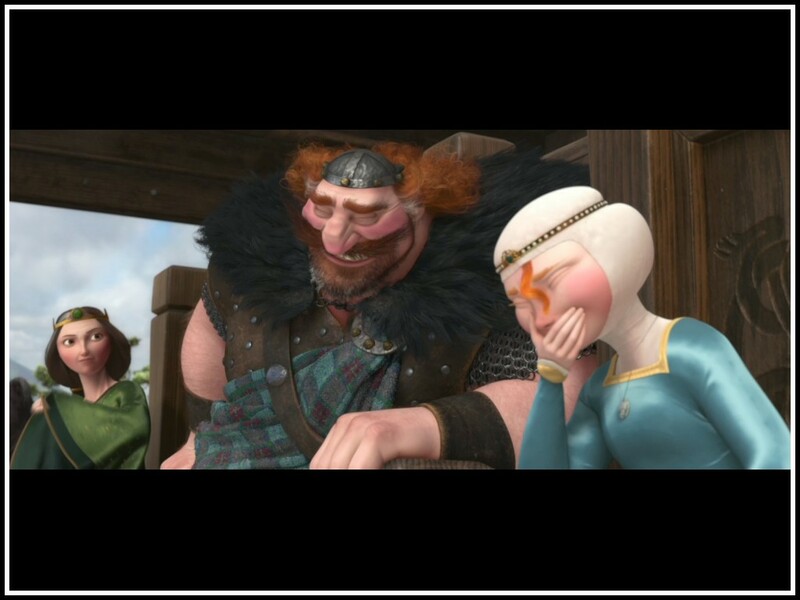 "Brave" teeters on the edge of being a pure chick flick. Everything revolves around Merida's relationship with her mother and how that can be resolved. The spells and marriage arrangements and so forth are simply detours along the path of these two learning to get along with each other. The setting, in the Scottish medieval mists, is very romantic and conveys a sense of fantasy. The Celtic music composed by Patrick Doyle adds to this ethereal flavor. It is a very female-centric tale. The men, such as Merida's brothers, are not very heroic at all, and only get in the way of the women who are intent on moving things along. There is a lot of "family time" that you won't see in, say, a Batman superhero flick. The dilemma of crushing importance is not battling intergalactic invaders, but seeing that mother and daughter resolve their catty issues. The whole conceit of the problems being caused by Merida trying to change her mother - and not herself, as in most "coming of age" stories - gives the story a cautionary feel. The ending is a bit confusing. It turns out that mother, not daughter, has changed. Some coming of age! In fact, it is unclear if Merida has learned anything at all other than not to give her mother poisoned cakes. "Fate" and "destiny" are mentioned in a voice-over at the film's beginning, but no hints are given as to what Merida's fate or destiny might be. "Brave" turns the notion of a traditional Disney princess on its head. Apparently, rather than have people acting on her and arranging things on her behalf, the new princess goes out and messes things up enough so that nothing really gets resolved and she has to apologize. The ultimate "moral of the story," that girls should marry for love, might have been groundbreaking in the time the story is set, but it seems awfully quaint. Pixar is good at a lot of things, but this film doesn't include much of the wit and humor that usually place its offerings above the pack. There were some personnel problems during the lengthy incubation of this film, with Chapman being replaced by Andrews for reasons unknown. The uneven tone and unclear message evidences this. While Andrews thanked Chapman while accepting an award for the film, one gathers the parting was not completely harmonious - but real life is not a fairy tale. Another thing that might turn some viewers off is the main character, Merida. Rumor has it that they spent two years and developed an entire computer program just to display every single strand of Merida's hair. While an epic technical and artistic achievement, the results are a bit mixed from an entertainment standpoint. 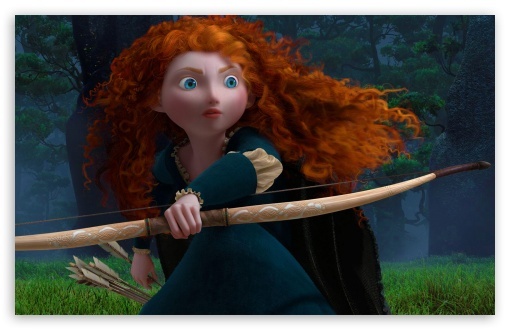 The Pixar animation is awesome, as always, but the way Merida is drawn almost makes her look like a troll doll. If you like red-heads, you will be enchanted by her presentation, and apparently an awful lot of resources went into getting her hair just right. 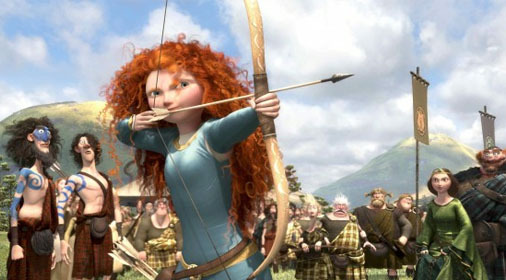 Merida may be a big ol' tomboy, but some things in life and animation are eternal: the girl's hair better be just right! No matter what else we may say about this picture: the hair is fabulous. This is a strange tale to come out of the happy-go-lucky Pixar studio, with weird messages that won't resonate with every viewer. However, some people really feel that "Brave" speaks to them. It did win the "Best Animated Film" Oscar, so it has that going for it. In addition, Princess Merida was officially introduced into the "Princess" line-up in 2013. 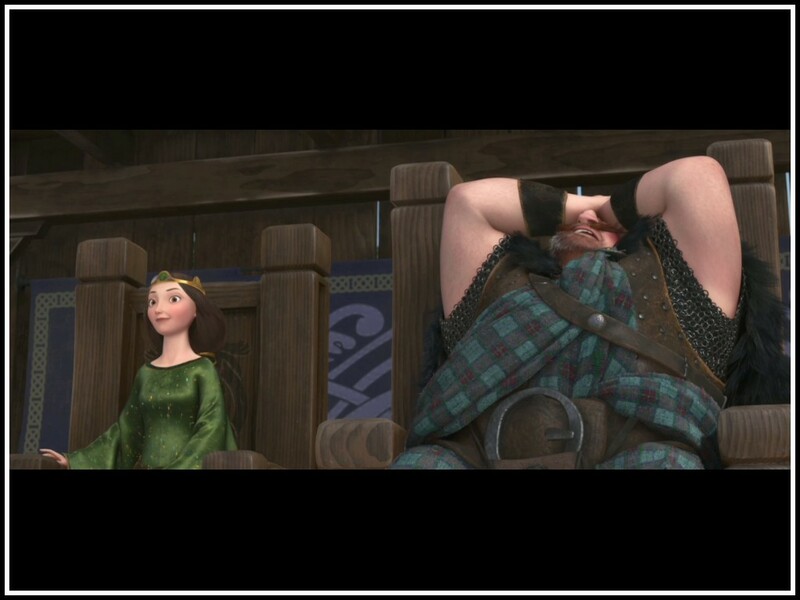 "Brave" is recommended for those who want to enjoy a female-empowerment story, and the animation isn't bad, either.